In May 2016, PDRMG were invited by Wakefield Naturalists’ Society to ring the young Peregrine Falcons at the Cathedral in Wakefield. 4 Birds were ringed with BTO metal rings and fitted with Orange Darvic Rings 3Z, 4Z, 5Z and 6Z. 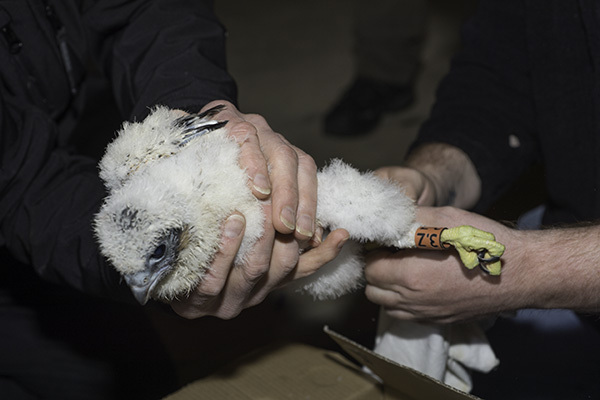 Darvic rings are fitted to help us better understand the movements of urban nesting Peregrines following natal dispersal. 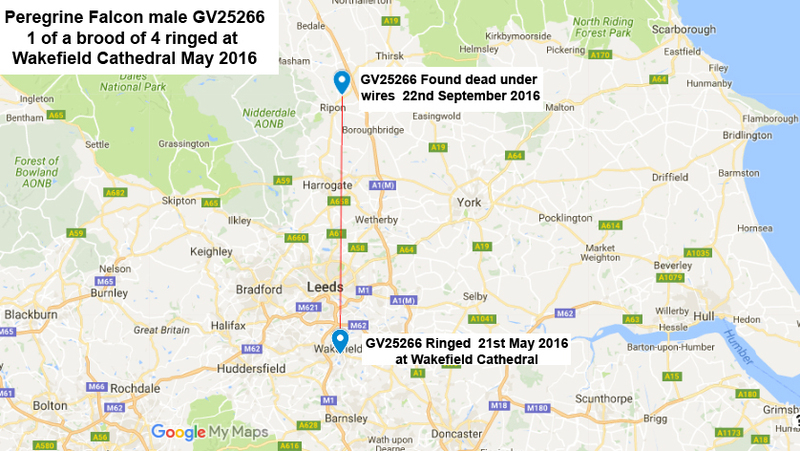 We received notice from the BTO of the recovery of one of the birds GV25266 – Orange 3Z. The bird had collided with overhead powerlines near Ripon, North Yorkshire and had died. 56KM North of the cathedral and 124 days after ringing. This entry was posted in birds of prey, Darvic, dead bird of prey, Falco peregrinus, Hit wires, Peregrine Falcon, Protection, raptor, Recoveries, reporting, reporting ringed birds, ringed bird, ringed bird of prey, Wakefield Cathedral, Wakefield Naturalists’ Society and tagged Bird of Prey, bird ringing, BTO, dead bird of prey, Falco peregrinus, Peak District Raptor Monitoring Group, raptor group, raptor monitoring, recoveries, reporting dead birds, reporting ringed birds. Bookmark the permalink.